Use the code PCG to save yourself 20%. 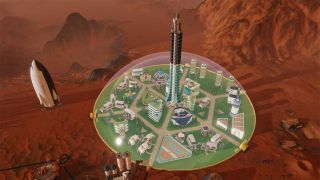 Surviving Mars, the upcoming survival city builder from Paradox Interactive, will be making its presence known at the PC Gamer Weekender in a talk exploring the mechanics and thought process behind the game. Gabriel Dobrev and Ivan-Assen Ivanov from developer Haemimont Games will be joined by Jakob Munthe, of publisher Paradox, to talk system-driven design and, in their words, ‘how to avoid the self-playing piano’. With decades of experience between the three, this is sure to be a deep, knowledgeable and downright interesting talk on the thinking—and sheer effort—that goes into making a title like Surviving Mars. In the game, the player is tasked with building mankind’s first home away from home: a permanent colony on Mars, with the talk covering the interactions between a human player and deep AI simulations—how do you create interesting player choices in a system driven game? Find all our coverage of Surviving Mars here. You’ll be able to see many more speakers, games and booths all at the PC Gamer Weekender, which is being held February 17-18 at the Olympia, London, in the UK. For more details see the site, and follow us on Twitter for up-to-the-minute news. Tickets are available now from £12.99. Use the code PCG to save 20%.